Curious how much water you’ll need to fill your backyard rink? Need to figure out how long it’ll take? Want to know how much water each homeboni treatment will require? Below is a link to an excel file with a few simple calculators that will answer those questions. Until I can find someone who can code these calcs directly into this page, simply right click on the link below and select “Save As” to download the file to your hard drive. If you want to use the “How Long To Fill” calc, you’ll need to know how fast your hose pumps out water, which is measured in gallons-per-minute (or GPM). To determine this, grab a 5-gallon bucket, your hose, and a stopwatch, and time how many seconds it takes to fill the bucket. Divide 300 by the number of seconds it took, which will give you your hose’s flow rate. (For example, if it took you 45 seconds to fill the 5-gallon bucket, your calculation would be: 300/45 = 6.67 gallons-per-minute.) You can then enter your GPM calculation into the file above. 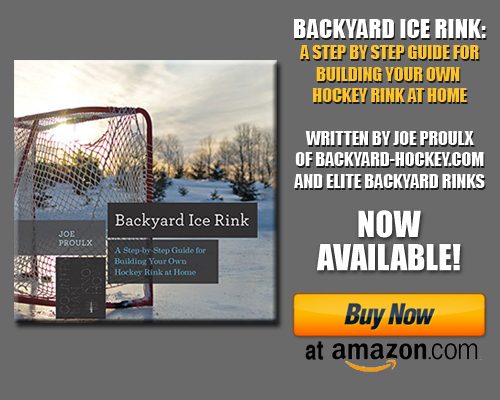 Want more Backyard-Hockey.com content? Please consider joining our mailing list, adding our RSS feed, liking us on Facebook, or following us on Twitter! THANKS FOR THE INFO….GREAT LINK! When I did my initial fill, I got a thin frozen layer overtop of an air void which is then over water. Is this normal? Should I break the frozen layer so that it drops into the unfrozen water? I am still well below my fill line.